The OnePlus 5 will be officially revealed on June 20th, but it turns out that we don’t have to wait until then to get a look at the new flagship Android phone’s design. A new image has leaked out that reportedly shows the front and rear of the OnePlus 5. The image, shared by Android Police, only shows the upper half of the device, so while the entire design hasn’t been revealed, this leak does give us a good idea of what the OP5 will look like. 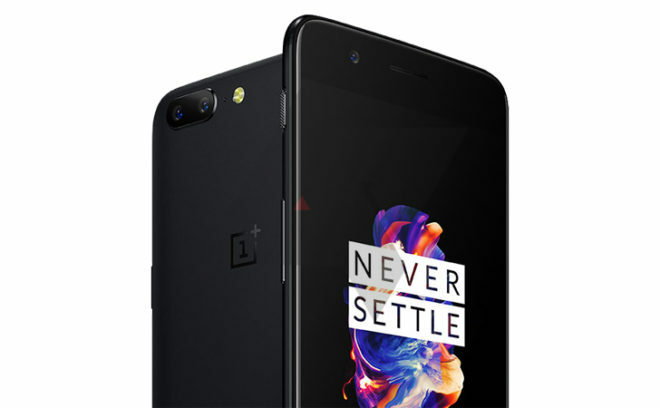 The most notable detail about this leaked image is that the OnePlus 5 features a dual rear camera setup. That would make it the first OnePlus phone to have such a feature. The dual rear camera setup is kind of a trendy feature in mobile, with companies like Apple, LG, Huawei, and others offering flagships with that feature. Now it looks like OnePlus will be getting in on it, too, but it’s unclear exactly what features these dual rear cameras will offer. Other features shown in this leaked image include a front-facing camera, mute switch, volume rocker, and power/lock key. The design of the OnePlus 5 shown in this leaked image is kind of reminiscent of the iPhone 7 Plus, but we’ll have to wait until June 20th before we get to see the entire device and find out what features it’s packing. It’ll be interesting to see what camera features OnePlus will include in the OP5, especially since it’s collaborating with DxO on the camera performance, and what price point the OnePlus 5 launches at. What do you think of this leaked OnePlus 5 design? Meh… OnePlus5…. what about a refreshed Axon 8 by ZTE??? Samsung not worried from appearances. No, it’s not a bad phone. They helped start the mid priced but feature packed phone segment. Look at all of the companies that followed their lead. Their sales might be small, but their influence is huge. I guess the Nexus line never existed. Great hardware with vanilla android at a cheap price. I want this to be my next phone but man it sure does look like the iPhone 7+, haha. T-Mobile will not sell this POS, so good luck with warranty and tech support.